The first African American woman to command a ship in the U.S. Navy made history again Tuesday when she became the first woman promoted to Admiral in the service’s 239-year history. The Navy appointed Vice Adm. Michelle Howard to be the next Vice Chief of Naval Operations, pinning a fourth star on her shoulder and making her the second senior-most officer in the Navy, during a ceremony at Arlington National Cemetery. 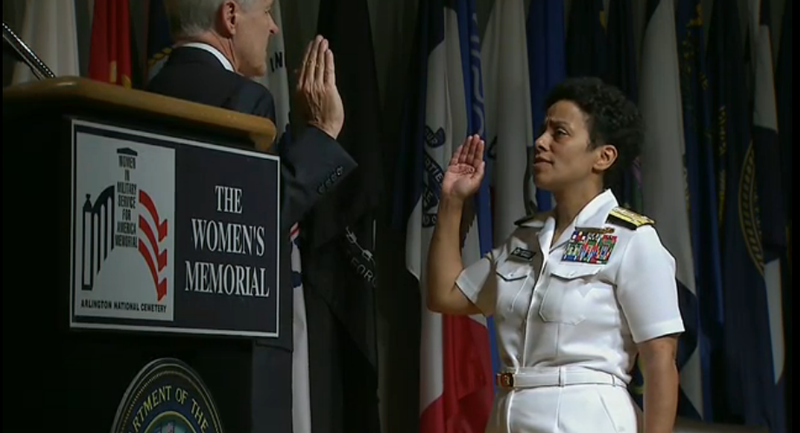 Navy Secretary Ray Mabus promotes Vice Admiral Michelle Howard, making her the first woman admiral in the Navy’s 239-year history. Howard is a 1982 graduate of the U.S. Naval Academy and was one of the first women to graduate from the school. By 1999, she took command of USS Rushmore (LSD 47), becoming the first African American woman in the Navy to do so. In 2009, she commanded Task Force 151, the multinational counter-piracy effort made famous during the rescue of Maersk Alabama Captain Richard Phillips, who had been taken hostage by Somali pirates in the Gulf of Aden. “Her accomplishment is a direct example of a Navy that now, more than ever, reflects the nation it serves — a nation where success is not borne of race, gender or religion, but of skill and ability,” Mabus said. Chief of Naval Operations Adm. Jonathan Greenert called Howard’s “trailblazing accomplishments” evidence that she is the right officer for the job of VCNO. Howard may have been ready to break the last remaining glass ceiling in the Navy, but the institutional Navy was a little slower to respond. “When I called to order four-star shoulder boards for women, they didn’t exist,” she said during remarks at her promotion ceremony.